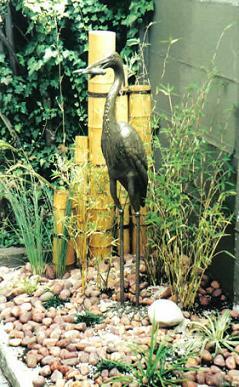 Japanese symbolism in garden design is explained. There is a lot of controversy about this Japanese garden design concept. Hear both sides of the story on symbolism in Japanese gardens. The main object of Japanese gardens is to copy the beauty of nature and to bring it home. There is little space in Japan. It is not possible for the average Japanese family to have a large garden. They adapted to be able to enjoy nature. This adaptation is most obvious in the art of Bonsai. This is the art of cultivating miniature trees. Although the garden is small, it can still have a beautiful tree! The inventive Japanese have used other natural materials to represent objects that would just be too large for their gardens. This practice most probably led to the mystique of Japanese symbolism in gardening. One viewpoint is that symbolism has really been blown out of proportion and detracts from the main object of Japanese gardens, i.e. to copy the beauty of nature. Every culture has their symbols, myths, urban legends, etc. Some people believe in it, others don’t. A little bit of symbolism could be healthy, e.g. the Stripes and Stars symbolize liberty and freedom to patriotic Americans, the sun representing god, unified the ancient Egyptians, etc. Symbolism is used in Japanese garden design. Just remember that you should not try to symbolize everything in the garden. This will detract from purpose of the garden. Use symbolism in moderation, and enjoy your garden.